Are Your Security Systems Reliable? How confident are you in your security systems? Just a glance at reports of data losses should temper any confidence you may have. Verizon’s 2018 Data Breach Investigations Report (DBIR), as it is every year, should serve as a wakeup call. Or as the report writers put it: identifying 53K+ incidents in only 12 months suggests an information security dystopia, an uneven playing field where the bad guys consistently win out. The 2018 report, in that regard, is not much different from previous years’ reports. Syncsort, a leading mainframe ISV, released its own security survey results among 300 survey responders. It found 85 percent of respondents are either very or somewhat confident in their organization’s security program although 41 percent said their company had experienced a security breach and 20 percent more were unsure. I’d be more nervous about the 20% who weren’t sure than the 41 % who, at least, had identified a security breach. You can find Syncsort’s security announcement here. To Syncsort, a particularly interesting challenge appeared to come from new data sources. Specifically, seven percent were familiar with newer but widely-adopted data storage options like Hadoop data lakes. Fortunately, security (42%) and cloud computing (35%) are organizations’ top two IT priorities in the coming year. It probably is too much, however, to expect management will increase security staffing until the organization finds its security breach on the front page of a large daily newspaper like the New York Times or Wall Street Journal. This is the corporate equivalent to shutting the proverbial gate after the horses (or data) have left. So who are the bad guys you are up against. Verizon has an answer to this: Almost three-quarters (73%) of cyberattacks were perpetrated by outsiders. Members of organized criminal groups were behind half of all breaches, with nation-state or state-affiliated actors involved in 12%. But don’t get complacent. Insider threats may be the hardest to defend against. Over a quarter (28%) of attacks involved insiders. The insider threat can be particularly difficult to guard against, as Verizon points out, since it can be difficult to spot the signs if someone is using their legitimate access to your data for nefarious purposes. Or to put it another way, the chances are you should be more nervous about a disgruntled employee than about a North Korean agent. Similarly, audit security regularly. Most audit only annually but a few audit more frequently. More frequently leads to better security. As Syncsort found: Thirty-two percent of responding organizations only perform security audits annually, while 23 percent do so every three months and 19 percent every six months. The areas you examine in audits also can help you improve security effectiveness. For example, Syncsort survey responders were most likely to examine application security (72%), backup/disaster recovery processes (70%), network security (69%), and antivirus programs and password policies (67% each). Not surprisingly different organizations have different security priorities. For example, security (42%) and cloud computing (35%) are top two IT priorities for the majority of organization in the coming year. However, twenty-eight percent of respondents named adoption of cloud services as their top security-related challenge, followed by growing complexity of regulations (20%), and insufficient IT security staffing (19%). Respondents also differed on which regulation they felt they had to meet first. The regulation most respondents reported having to meet: GDPR (37%), followed by HIPAA and SOX (32% each). If you have had a chance to periodically review the various Verizon Data Breach Investigations Reports, you won’t be surprised to learn that organizations continue to experience data breaches. Specifically, Syncsort found: forty-one percent of organizations have experienced data breaches, while 39 percent have not, However, 20 percent say they don’t know? Kinda scary. While IBM is focused on battling the hyperscalers for cloud dominance and trying to overcome the laws of physics with quantum computing a second tier of mainframe ISVs are trying to advance mainframe data center performance. Syncsort. For instance, late in November Syncsort acquired EView Technology, Raleigh NC, to integrate mainframe and IBM i data into its enterprise IT management platform, Ironstream. EView would seem a predictable choice for a Syncsort strategic acquisition. It also can be seen as yet another sign that value today lies in efficient data integration and analysis. In this case, Syncsort bolstered its capability to harvest log data originating on IBM i and mainframes through the acquisition of EView Technology, which builds big iron connectors for mainstream systems management tools. Meanwhile, through multiple acquisitions Syncsort’s Ironstream has emerged as a leading option for forwarding critical security and operational machine data from mainframes and IBM i servers for deeper analysis. This, in turn, enables the data to be streamed and correlated with data from the rest of the enterprise within Splunk and other Security Information and Event Management (SIEM) and IT Operations Analytics (ITOA) products. For Syncsort EView was a typical acquisition target. It served mainframe and IBM i customers and EView would expand Ironstream functionality. Not surprisingly, each company’s products are architected differently. EView sends it data through a lightweight agent as an intermediary and makes active use of ServiceNow, a ready‑built foundation that transforms how a business operates, while Ironstone takes a more direct approach by sending data directly to Splunk. Each approach has its strengths, says David Hodgson, Syncsort’s Chief Product Officer. One possibility: Syncsort could augment the EView agent with Ironstream while giving customers a choice. Those decisions will be taken up in earnest in January. Furthermore, in addition to Splunk and the Elastic Stack, Ironstream will now be able to integrate this data with ServiceNow Discovery, Microsoft System Center, and Micro Focus Operations Manager. With the EView acquisition, Syncsort just expands it footprint in mainframe data analytics. “ServiceNow in particular is attracting excitement,” said Hodgson. In addition, customers can augment their EView agent with Ironstream, effectively giving customers a new choice. In addition, EView’s enterprise-proven Intelligent Agent Technology will bolster Syncsort’s ability to offer organizations more options in integrating different data sources with advanced management platforms for a more comprehensive view. Syncsort’s Ironstream is now part of the growing Syncsort Integrate family of products. It has emerged as an industry leading solution for forwarding critical security and operational machine data from mainframes and IBM i servers for analytic purposes. This enables the data to be streamed and correlated with data from the rest of the enterprise within Splunk and other SIEM and ITOA solutions. Last week IBM reveled in the attention of upwards of 30,000 visitors to its Think conference, reportedly a record for an IBM conference. Meanwhile Syncsort and Compuware stayed home pushing new mainframe initiatives. Specifically, Syncsort introduced innovations to deliver mainframe log and application data in real-time directly to Elastic for deeper next generation analytics through like Splunk, Hadoop and the Elastic Stack. Compuware reported that the percentage of organizations running at least half their business-critical applications on the mainframe expected to increase next year, although the loss of skilled mainframe staff, and the failure to subsequently fill those positions pose significant threats to application quality, velocity and efficiency. Compuware has been taking the lead in modernizing the mainframe developer experience to make it compatible with the familiar x86 experience. According to David Hodgson, Syncsort’s chief product officer, many organizations are using Elastic’s Kibana to visualize Elasticsearch data and navigate the Elastic Stack. These organizations, like others, are turning to tools like Hadoop and Splunk to get a 360-degree view of their mainframe data enterprise-wide. “In keeping with our proven track record of enabling our customers to quickly extract value from their critical data anytime, anywhere, we are empowering enterprises to make better decisions by making mission-critical mainframe data available in another popular analytics platform,” he adds. For cost management, Syncsort now offers Ironstream with the flexibility of MSU-based (capacity) or Ingestion-based pricing. Compuware took a more global view of the mainframe. The mainframe, the company notes, is becoming more important to large enterprises as the percentage of organizations running at least half their business-critical applications on that platform expected to increase next year. However, the loss of skilled mainframe staff, and the failure to subsequently fill those positions, pose significant threats to application quality, velocity and efficiency. The survey of mainframe decision-makers and developers in the US and Europe also revealed the growing mainframe importance–64 percent of enterprises will run more than half of their critical applications on the platform within the next year, up from 57 percent this year. And just to ratchet up the pressure a few notches, 72 percent of customer-facing applications at these enterprises are completely or very reliant on mainframe processing. That means the loss of essential mainframe staff hurts, putting critical business processes at risk. Overall, enterprises reported losing an average of 23 percent of specialized mainframe staff in the last five years while 63 percent of those positions have not been filled. Nobody has 10 years or even three years to cultivate a new mainframer. You need to attract and cultivate talented x86 or ARM people now, equip each—him or her—with the sexiest, most efficient tools, and get them working on the most urgent items at the top of your backlog. IBM appears to be so busy pursuing its strategic imperatives—security, blockchain, quantum computing, and cognitive computing—that it seems to have forgotten the daily activities that make up the bread-and-butter of mainframe data centers. Stepping up to fill the gap have been mainframe ISVs like Compuware, Syncsort, Data Kinetics, and a few others. IBM hasn’t completely ignored this need. For instance, Project DataWorks uses Watson Analytics and natural language processing to analyze and create complex visualizations. Syncsort, on the other hand, latched onto open Apache technologies, starting in the fall of 2015. Back then it introduced a set of tools to facilitate data integration through Apache Kafka and Apache Spark, two of the most active Big Data open source projects for handling real-time, large-scale data processing, feeds, and analytics. Syncsort’s primary integration vehicle then revolved around the Intelligent Execution capabilities of its DMX data integration product suite with Apache Spark. Intelligent Execution allows users to visually design data transformations once and then run them anywhere – across Hadoop, MapReduce, Spark, Linux, Windows, or Unix, both on premise or in the cloud. Since then Syncsort, in March, announced another big data integration solution. This time its DMX-h, is now integrated with Cloudera Director, enabling organizations to easily deploy DMX-h along with Cloudera Enterprise on Amazon Web Services, Microsoft Azure, or Google Cloud. By deploying DMX-h with CDH, Syncsort explained, organizations can quickly pull data into new, ready-to-work clusters in the cloud. This accelerates how quickly they can take advantage of big data cloud benefits, including cost savings and Data-as-a-Service (DaaS) delivery. A month before that, this past February, Syncsort introduced new enhancements in its Big Data integration solution by again deploying DMX-h to deliver integrated workflow capabilities and Spark 2.0 integration, which simplifies Hadoop and Spark application development, effectively enabling mainframe data centers to extract maximum value from their data assets. In addition, Syncsort brought new integrated workflow capabilities and Spark 2.0 integration to simplify Hadoop and Spark application development. It lets data centers tap value from their enterprise data assets regardless of where it resides, whether on the mainframe, in distributed systems, or in the cloud. Syncsort’s new integrated workflow capability also gives organizations a simpler, more flexible way to create and manage their data pipelines. This is done through the company’s design-once, deploy-anywhere architecture with support for Apache Spark 2.0, which makes it easy for organizations to take advantage of the benefits of Spark 2.0 and integrated workflow without spending time and resources redeveloping their jobs. Assembling such an end-to-end data pipeline can be time-consuming and complicated, with various workloads executed on multiple platforms, all of which need to be orchestrated and kept up to date. Delays in such complicated development, however, can prevent organizations from getting the timely insights they need for effective decision-making. Enter Syncsort’s Integrated Workflow, which helps organizations manage various workloads, such as batch ETL on large repositories of historical data. This can be done by referencing business rules during data ingest in a single workflow, in effect simplifying and speeding development of the entire data pipeline, from accessing critical enterprise data, to transforming that data, and ultimately analyzing it for business insights. Finally, in October 2016 Syncsort announced new capabilities in its Ironstream software that allows organizations to access and integrate mainframe log data in real-time to Splunk IT Service Intelligence (ITSI). Further, the integration of Ironstream and Compuware’s Application Audit software deliver the audit data to Splunk Enterprise Security (ES) for Security Information and Event Management (SIEM). This integration improves an organization’s ability to detect threats against critical mainframe data, correlate them with related information and events, and satisfy compliance requirements. Compuware’s point is to position the mainframe at the heart of agile DevOps computing. As part of the effort, it needs to deliver slick, modern tools that will appear to the non-mainframers who are increasingly moving into multi-platform development roles that include the mainframe. These people want to work as if they are dealing with a Windows or Linux machine. They aren’t going to wrestle with arcane mainframe constructs like Abends or JCL. Traditional mainframe dev, test and code promotion processes are simply too slow to meet the demands of today’s fast-moving markets. The new dev and ops people who are filling out data center ranks haven’t the patience to learn what they view as antiquated mainframe concepts. They need intelligent tools that visualize the issue and let them intuitively click, drag, drop, and swipe their way through whatever needs to be done. This is driven by the long-expected attrition of veteran mainframers and the mainframe knowledge and application insight they brought. Only the recession that began in 2008 slowed the exit of aging mainframers. Now they are leaving; one mainframe credit card processor reportedly lost 50 mainframe staff in a month. The only way to replace this kind of experience is with intelligent and easy to learn tools and expert automation. Compuware’s response has been to release new tools and enhancements every quarter. It started with Topaz in 2015. DancingDinosaur covered it Jan. 2015 here. The beauty of Topaz lies in its graphical ease-of-use. Data center newbies didn’t need to know z/OS; they could understand what they were seeing and do meaningful work. With each quarterly release Compuware, in one way or another, has advanced this basic premise. The most recent advances are streamlining the DevOps process in a variety of ways. DevOps has emerged as critical with mainframe shops scrambling to remain relevant and effective in a rapidly evolving app dev environment. Just look at Bluemix if you want to see where things are heading. Enterprises must aggressively adopt DevOps disciplines in their mainframe environments to fulfill business requirements for digital agility. Traditional mainframe dev, test and code promotion processes are simply too slow to meet the demands of today’s fast-moving markets to counter new, digitally nimble market disruptors. Data centers need to better integrate the toolchains that support their newly adopted mainframe DevOps workflows with those that support DevOps across their various other platforms. This is because mainframe applications and data so often function as back-end systems-of-record for front-end web and mobile systems-of-engagement in multi-tier/cross-platform environments. In the second announcement Compuware integrated Abend-AID and Syncsort’s Ironstream to give fast, clear insight into mainframe issues. Specifically, the integration of Abend-AID and Ironstream \ enables IT to more quickly discover and act upon correlations between application faults and broader conditions in the mainframe environment. This is particularly important, notes Compuware, as enterprises, out of necessity, shift operational responsibilities for the platform to staffs with limited experience on z/OS. Just put yourself into the shoes of a distributed system manager now dealing with a mainframe. What might appear to be a platform issue may turn out to be software faults, and vice versa. The retired 30-year mainframe veterans would probably see it immediately (but not always). Mainframe newcomers need a tool with the intelligence to recognize it for them. With the last announcement Compuware and Software Engineering of America (SEA) introduced the release of SEA’s JCLplus+ Remote Plug-In and $AVRS Plug-In for Compuware’s Topaz Workbench mainframe IDE. Again think about mainframe neophytes. The new plug-ins for Topaz significantly ease challenging JCL- and output-related tasks, according to Compuware, effectively enabling both expert and novice IT staff to perform those tasks more quickly and more accurately in the context of their other mainframe DevOps activities. An encouraging aspect of this is that Compuware is not doing this alone. The company is teaming up with SEA and with Syncsort to make this happen. As the mainframe vendors work to make mainframe computing easier and more available to lesser trained people it will be good for the mainframe industry as a whole and maybe even help lower the cost of mainframe operations. DancingDinosaur is Alan Radding, a veteran information technology analyst, writer, and ghostwriter. Please follow DancingDinosaur on Twitter, @mainframeblog. See more of his IT writing at technologywriter.com and here. Running Syncsort’s Ironstream and leveraging Splunk Enterprise, Medical Mutual of Ohio has now implemented mainframe security in real time through the Splunk® Enterprise platform. One goal is to help protect customer information stored in DB2 from unauthorized access. Syncsorts’s Ironstream, a utility, collects and forwards z/OS log data, including security data, to Splunk Enterprise and Splunk Enterprise Security. “We’ve always had visibility. Now we can get it faster, in real time directly from the mainframe,” said the insurer’s enterprise security supervisor. Previously, the company would do a conventional data transfer, which could take several hours. The new approach, sometimes referred to as a big iron-to-big data strategy, now delivers security log data in near real time. This enables the security team to correlate all the security data from across the enterprise to effectively and quickly gain visibility into user-authentication data and access attempts tracked on the mainframe. And they can do it without needing specialized expertise or different monitoring systems for z/OS. Real-time analytics, including real-time predictive analytics, are increasingly attractive as solutions for the growng security challenges organizations are facing. These challenges are due, in large part, to the explosion of transaction activity driven by mobile computing, and soon, IoT, and Blockchain, most of which eventually finds its way to the mainframe. All of these present immediate security concerns and require fast, nearly instant security decisions. Even cloud usage, which one would expect to be mainstream in enterprises by now, often is curtailed due to security fears. With the Ironstream and Splunk combination, Medical Mutual Medical Mutual can see previously slow-to-access mainframe data alongside other security information it was already analyzing in Splunk Enterprise. Splunk Enterprise enables a consolidated enterprise-wide view of machine data collected across the business, which makes it possible to correlate events that might not raise suspicion alone but could be indicative of a threat when seen together. The deployment proved to be straightforward. Medical Mutual’s in-house IT team set it up in a week with Syncsort answering deployment questions to assist. Although there are numerous tools to capture log data from the mainframe, the insurer chose to go with the Splunk-Ironstream combination because it already was using Splunk in house for centralized logging. Adding mainframe security logs was an easy step. “This was affordable and it saved us from having to learn another product,” the security supervisor added. Medical Mutual runs a z13, model 409 with Ironstream. Track security events and data from multiple platforms including IBM z/OS mainframes, Windows and distributed servers and correlate the information in Splunk Enterprise for better security. Diagnose and respond to high severity security issues more quickly since data from across the entire enterprise is being monitored in real time. Provide monthly and daily reporting with an up-to-the-minute account of unusual user activity. Detect security anomalies and analyze their trends – the cornerstone of Security Information and Event Management (SIEM) strategies. Real time monitoring with analytics has proven crucial for security. You can actually detect fraud while it is taking place and before serious damage is done. It is much harder to recoup loses hours, days, or, what is often the case, months later. The Splunk platform can handle massive amounts of data from different formats and indexes and decipher and correlate security events through analytics. Ironstream brings the ability to stream mainframe security data for even greater insights, and Ironstream’s low overhead keeps mainframe processing costs low. To try the big iron-to-big data strategy organizations can download a free Ironstream Starter Edition and begin streaming z/OS Syslog data into Splunk solutions. Unlike typical technology trials, the Starter Edition is not time-limited and may be used in production at no charge. This includes access to the Ironstream applications available for download on Splunkbase. Syncsort’s annual survey of almost 200 mainframe shops found that 83 percent of respondents cited security and availability as key strengths of the mainframe. Are you surprised? You can view the detailed results here for yourself. Security and availability have been hallmarks of the z for decades. Even Syncsort’s top mainframe executive, Harvey Tessler, could point to little unexpected in the latest results “Nothing surprising. At least no big surprises. Expect the usual reliability, security,” he noted. BTW, in mid-November Clearlake Capital Group, L.P. (Clearlake) announced that it had completed the acquisition of Syncsort Incorporated. Apparently no immediate changes are being planned. The 2015 study also confirmed a few more recent trends that DancingDinosaur has long suspected. More than two-thirds (67 percent) of respondents cited integration with other standalone computing platforms such as Linux, UNIX, or Windows as a key strength of mainframe. Similarly, the majority (79 percent) analyze real-time transactional data from the mainframe with a tool that resides directly on the mainframe. That, in fact, may be the most surprising response. Mainframe shops (or more likely the line-of-business managers they work with) are notorious for moving data off the mainframe for analytics, usually to distributed x86 platforms. The study showed respondents are also turning to platforms such as Splunk (11.8 percent), Hadoop (8.6 percent), and Spark (1.6 percent) to supplement their real-time data analysis. Many of the respondents no doubt will continue to do so, but it makes little sense in 2015 with a modern z System running a current configuration. In truth, it makes little sense from either a performance or a cost standpoint to move data off the z to perform analytics elsewhere. The z runs Hadoop and Spark natively. With your data and key analytics apps already on the z, why bother incurring both the high overhead and high latency entailed in moving data back and forth to run on what is probably a slower platform anyway. The only possible reason might be that the mainframe shop doesn’t run Linux on the mainframe at all. That can be easily remedied, however, especially now with the introduction of Ubuntu Linux for the z. C’mon, it’s late 2015; modernize your z for the cloud-mobile-analytics world and stop wasting time and resources jumping back and forth to distributed systems that will run natively on the z today. More encouraging is the interest of the respondents in big data and analytics. “The survey demonstrates that many big companies are using the mainframe as the back-end transaction hub for their Big Data strategies, grappling with the same data, cost, and management challenges they used it to tackle before, but applying it to more complex use cases with more and dauntingly large and diverse amounts of data,” said Denny Yost, associate publisher and editor-in-chief for Enterprise Systems Media, which partnered with Syncsort on the survey. The results show the respondents’ interest in mainframe’s ability to be a hub for emerging big data analytics platforms also is growing. On other issues, almost one-quarter of respondents ranked as very important the ability of the mainframe to run other computing platforms such as Linux on an LPAR or z/VM virtual machines as a key strength of the mainframe at their company. Over one-third of respondents ranked as very important the ability of the mainframe to integrate with other standalone computing platforms such as Linux, UNIX, or Windows as a key strength of the mainframe at their company. Maybe more surprising; only 70% on the respondents ranked as very important their organizations use of the mainframe for performing large-scale transaction processing or use of the mainframe for hosting mission-critical applications. Given that the respondents appeared to come from large, traditional mainframe shops you might have expected those numbers to be closer to 85-90%. Go figure. When asked to rank their organization’s use of the mainframe to supplement or replace non-mainframe servers (i.e. RISC or x86-based servers) just 10% of the respondents considered it important. Clearly the hybrid mainframe-based data center is not a priority with these respondents. These aren’t the most ambitious goals DancingDinosaur has ever encountered but they should be quite achievable in 2016. In a series of announcements last month, Syncsort integrated its DMX-h data integration software with Apache Kafka, an open distributed messaging system. This will enable mainframe shops to tap DMX-h’s easy-to-use GUI to subscribe, transform, enrich, and distribute enterprise-wide data for real-time Kafka messaging. Syncsort also delivered an open source contribution of an IBM z Systems mainframe connector that makes mainframe data available to the Apache Spark open-source analytics platform. Not stopping there, Syncsort is integrating the Intelligent Execution capabilities of its DMX data integration product suite with Apache Spark too. Intelligent Execution allows users to visually design data transformations once and then run them anywhere – across Hadoop, MapReduce, Spark, Linux, Windows, or Unix, on premise or in the cloud. Said Tendü Yoğurtçu, General Manager of Syncsort’s big data business, in the latest announcement: “We are seeing increased demand for real-time analytics in industries such as healthcare, financial services, retail, and telecommunications.” With these announcements, Syncsort sees itself delivering the next generation streaming ETL and Internet of Things data integration platform. Of course, the Syncsort offer should be unnecessary for most z System users except those that are long term Syncsort shops or are enamored of Syncsort’s GUI. IBM already offers Spark native on z/OS and Linux on z so there is no additional cost. BTW, Syncsort itself was just acquired. What happens with its various products remains to be seen. Still IBM has been on a 12-year journey to expand mainframe workloads—Linux to Hadoop and Spark and beyond—the company has been urging mainframe shops as fast as fast as possible to become fully engaged in big data, open source, and more. The Syncsort announcements come at a precipitous time; mainframe data centers can more easily participate in the hottest use cases: real-time data analytics, streaming data analytics across diverse data sources, and more at the time when the need for such analytics is increasing. Apache Spark and some of these other technologies should already be a bit familiar to z System data centers; Apache Kafka will be less familiar. DancingDinosaur noted Spark and others here, when LinuxOne was introduced. To refresh, Apache Spark consists of a fast engine for large-scale data processing that provides over 80 high-level operators to make it easy to build parallel apps or use them interactively from the Scala, Python, and R shells. It also offers a stack of libraries including SQL and DataFrames, MLlib for machine learning, GraphX, and Spark Streaming. You can combine these libraries seamlessly in the same application. As noted above Syncsort offers an open source version of the IBM z Systems mainframe connector that makes mainframe data available to the Apache Spark open-source analytics platform. Spark already has emerged as one of the most active big data open source projects, initially as a fast memory-optimized processing engine for machine learning and now as the single compute platform for all types of workloads including real-time data processing, interactive queries, social graph analysis, and others. Given Spark’s success, there is a growing need to securely access data from a diverse set of sources, including mainframes, and to transform the data into a format that is easily understandable by Spark. Apache Kafka, essentially an enterprise service bus, is less widely known. Apache Kafka brings a fast, scalable, durable, and fault-tolerant publish-subscribe messaging system. Kafka is often used in place of traditional message brokers like JMS and AMQP because of its higher throughput, reliability and replication. Syncsort has integrated its data integration software with Apache Kafka’s distributed messaging system to enable users to leverage DMX-h’s GUI as part of an effort to subscribe, transform, enrich, and distribute enterprise-wide data for real-time Kafka messaging. According to Matei Zaharia, creator of Apache Spark and co-founder & CTO of Databricks: “Organizations look to Spark to enable a variety of use cases, including streaming data analytics across diverse data sources”. He continues: “Syncsort has recognized the importance of Spark in the big data ecosystem for real-time streaming applications and is focused on making it easy to bring diverse data sets into Spark.” IBM certainly recognizes this too, and the z System is the right platform for making all of this happen. 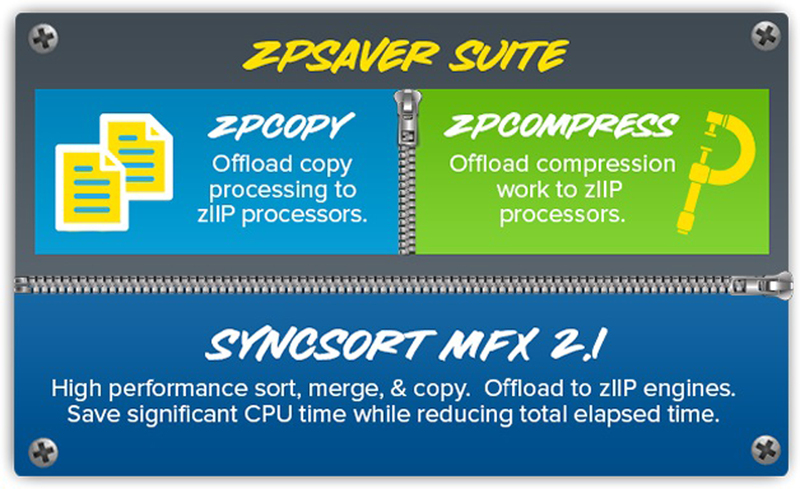 Last month Syncsort released two related products, the ZPSaver Suite and MFX Sort for z/OS, release 2.1. Both maximize the use of the System z’s zIIP co-processor to enable mainframe shops to reduce monthly software charges. The new Syncsort tool plays to points 1 and 2. Citing reports from various customers, a mainframe shop reported saving 17 MSU in one month, which translates into savings of about $250k over the year. Please note: Syncsort was unable to connect DancingDinosaur with any users to validate the savings. MFX 2.1 forms the foundation of the ZPSaver Suite, which also includes ZPCopy and ZPCompress. The first sends copy processing to the zIIP; the second directs compression processing to the zIIP. Together, these allow the mainframe data center to remove COPY and SMS compression workloads from the GP processor and run them on zIIP engines. Reportedly, there is no degradation in performance and possibly even potential improvements. With assist processors like the zIIP, IBM in effect sells discounted mainframe MIPS. In addition, workloads running on assist processors are not included in monthly workload charges, further adding to the potential savings. In short, you are able to replace billable GP cycles with already discounted zIIP processor cycles. Savvy mainframe data center managers can plan to purchase fewer full priced GP MIPS by deploying more assist processors and direct more workloads to them. This reduces the workload on the core GP processors from the start. By replacing GP processor MIPS with assist processor MIPS the organization can acquire the same overall number of MIPS at a lower acquisition cost while saving more money each month though lower fees. The trick, of course, is to redirect the workloads to the assist processor. Syncsort MFX also promises to effectively reduce Copy and SMS Compression for those tasks up to 90%. This also has the potential to improve SLA compliance the company reports. Again, DancingDinosaur has not yet been able to connect with actual users to validate this. Sort functions and compression have been part z/OS almost since the beginning. IBM offers its own sort and compress functionality. Syncsort didn’t invent sort and compress; they just architected the functions to work with the zIIP. They should work as expected with the most noticeable change coming in the monthly software charge, which is where you want to see it. Many z/OS shops also rely heavily on the COPY function during data transformation. According to Syncsort, a good percentage of its customers actually had more COPY executions than SORTs, making it an area ideally suited for zIIP offload. Syncsort also decided to include its DASD Parallel Access Volume (PAV) support to improve the elapsed time of these COPY applications as well as reduce the billable CPU time. The result: a reported 90% reduction in CPU time for COPY applications by offloading that workload to a zIIP engine. If the input and output for these COPY applications, the company continues, are on DASD devices, its PAV support will reduce the elapsed time by 25%. Mainframe SMS compression initially was created when storage was far more expensive than it is today. Still according to Syncsort, five out of six z/OS customers today continue as heavy users of SMS compression. DancingDinosaur is Alan Radding. Find him on Twitter, @mainframeblog. Or read more of his IT analysis and reporting at www.Technologywriter.com and here.